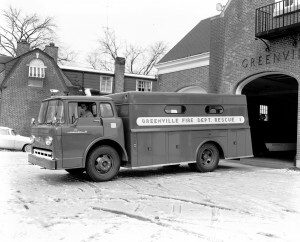 This Greenville rescue truck was one of the many pieces of fire apparatus that answered the call for help when disaster struck on the Glocester-Smithfield town line in 1962. Photo by Elwood Kelley, courtesy of John Tucker. There is an underground building, more of a bunker really, that is hidden in plain sight at the four-way intersection of Snake Hill Road, West Greenville Road, and Smith Avenue, almost directly on the Smithfield-Glocester town line. Built during the height of the Cold War in 1962, it was designed to withstand a nuclear attack. Hundreds of people pass it every day barely aware of its existence let alone the awful tragedy connected to it, for ironically, the building did suffer the effects of an explosion during its construction; a blast that left two men dead and eleven others injured. For those too young to remember, the Cold War was a time when the United States and the Soviet Union threatened mutual annihilation with nuclear weapons. In 1962, the Russians began building nuclear missile launch sites in Cuba, a move that led to a high-seas showdown between President Kennedy and Russian Premier Nikita Khrushchev in what became known as the Cuban Missile Crisis. It was the arms race and threat of a nuclear holocaust which led some forward thinkers such as Secretary of the Treasury Douglas Dillon to urge construction of protected sites for the storage of banking and financial records in the hopes that society would continue after the fallout. Thus it was that Industrial National Bank began construction of its ultimate safe-deposit box, an underground vault of re-enforced concrete located twelve miles northwest of Providence in what was then rural Rhode Island. Construction began in April of 1962, and all was proceeding on schedule until November 23rd, when an explosion tore through the cavernous structure, blackening walls, and blowing both bodies and equipment through doorways and hatches. For most working at the site, the shock came without warning; one moment they were at their jobs, the next moment they found themselves amidst total chaos and fighting for survival. Ernest Imondi, an electrician from Coventry, later related how a welder working in the main part of the building complained to him of a “knock” in the welding system. Imondi went to an adjacent room to inspect the generator used to power the welding torch, and when he returned he saw flames climbing a wall covered with one-inch thick insulation material. He grabbed a nearby fire extinguisher but discovered it didn’t work! As he and others began to shout warnings of “fire”, an explosion occurred. Two who felt the effects of the blast were Gerard Desjarlais, and Noe Barrette. Both were blown through an outside doorway and landed almost forty feet from where they had been standing. Remarkably, each man suffered only minor injuries, and quickly discovered that their proximity to the doorway had been a blessing. At least they were outside, away from the smoke and flames, and alive. Others weren’t as lucky. One man who was killed was 31 year-old Donald Arndt of Harrisville, who was tasked with insulating pipes in the computer room. It was only to be a one-day job, and he was nearly finished when the explosion occurred. That morning he had told his wife he would be leaving the construction site at 4 P.M., and expected to be home by five o’clock. The blast took place at ten minutes to four. Robert W. Knight of Knight’s Farm, located directly across the street, reported that he saw twenty to thirty foot flames shoot from an escape hatch atop the building, followed a few seconds later by black smoke. Within moments of the explosion, acrid smoke permeated the building, disorienting and choking those still inside. Men working close to the source of the flames suffered burns on various parts of their bodies, and were forced to crawl on their hands and knees to escape. In all, there were about thirty workmen present at the time of the accident. While most made it out, one who didn’t was 62 year-old Vincent Mulvey, an electrician from Pawtucket who found himself pinned beneath some staging. Charles S. Wilson Jr., a civil engineer and sport-scuba diver from Providence was in the parking lot at the time of the explosion, and when he heard that a man was trapped inside, he ran to his car and retrieved his scuba tank from the trunk. With the help of Edward Milazzo, he entered the building and located Mulvey. Wilson tried to teach Mulvey how to “buddy-breathe” off the scuba tank while he and Milazzo struggled to free him, but were unable to do so. When the air in the scuba tank ran out they were forced to abandon their mission and withdraw from the building. As it was, both Wilson and Milazzo had to be treated for smoke inhalation. Meanwhile, sirens were wailing at fire stations in Harmony, Greenville, Georgiaville, North Providence, and Scituate, as volunteers rushed from their homes and jobs to man the fire trucks. Fire engines from Harmony and Greenville were the first to arrive, and Chief William Corbin of the Harmony department took command. The danger was far from over. A fire in an underground building of this type presented special challenges, especially with only one way in or out. Corbin knew firefighters would have to lay hose lines and snake their way through the structure to hit the flames at their source, all the while enduring heat, smoke, and other dangers. The situation became even more acute when Corbin was informed that some workers were unaccounted for. He had no choice but to order some men into the building to fight the flames and search for the missing, while directing others to care for the injured. One firefighter tasked with search and rescue operations was 17 year-old Robert Aldrich of Harmony, who still lives about a mile from the disaster site. In a recent interview he related how he responded to the scene from his home, and upon his arrival, was told that three men were trapped inside. As he was donning his air-pack and other protective gear, one of the missing was carried from the building. That left two men still unaccounted for. With disregard for his own safety, Aldrich entered the smoky structure alone, with nothing more than a hand-held floodlight connected to a portable generator by a series of extension cords daisy-chained together. “The smoke was so thick that at first I couldn’t even tell if the light was on!” he recalled. Aldrich maneuvered his way through the inky darkness along a series of wooden planks and ramps traveling a considerable distance into the structure. Suddenly, through the smoke, he could hear the alarm bell of another firefighter’s air-pack sounding, indicating that the tank was low on air. Although he could see nothing, he moved towards the sound in case his comrade needed help. As he did so, he was bowled over in the darkness, presumably by the other firefighter who was understandably in a hurry to exit the building. As he recovered, Aldrich suddenly found himself in a dire situation, for he had dropped the floodlight which served as his only lifeline with outside world. Without it, he couldn’t follow the cord to backtrack his way out of the building! As he crawled about in near total blackness feeling for the floodlight cable that would lead him to safety, his own air supply began to run low! Aldrich remembered his training and didn’t panic. When his air supply ran out, he removed his face mask, and began gulping air from the space between his body and his fire coat. In this way the air was somewhat filtered, but he couldn’t go on that way for very long. It was then he found a ramp that seemed familiar and followed it. Luckily it proved to be the right way to salvation, or he might have become a third fatality in the incident. As it was, he developed pneumonia due to smoke inhalation and spent five days in the hospital. Fortunately he suffered no long-term effects, and went on to serve another twenty-eight years as a volunteer with the Harmony Fire Department. Another volunteer firefighter who was at the scene that day was 20 year-old John Tucker of Greenville. John remembered how he could see black smoke billowing in the distance from his home on West Greenville Road, and drove to the scene in his car. He arrived at the same time as one of the fire-rescue trucks; “I don’t remember if it was Greenville’s or Harmony’s’ he stated, ‘but I took an air-pack from the truck and began putting it on.” As he was doing so, a construction foreman ran over to him and asked to take the air-pack because he knew the layout of the building and Tucker didn’t. The young fireman had to make a quick decision; if he went in not knowing the structure’s floor plan he might be wasting valuable time. The foreman, he reasoned, would be familiar with the building, and more importantly, where men had been working at the time of the blast. With visibility in the building at near zero it seemed like the best course of action, and Tucker gave the man the air pack. Tucker then focused his attention on three men with soot-blackened faces suffering from smoke inhalation. After assisting them aboard one of the rescue trucks he accompanied them to Roger Williams Hospital. After turning the patients over to physicians, the rescue raced back to the scene. Smoke and flames weren’t the only dangers emergency workers faced that day as evidenced by the experience of another firefighter, 19 year-old Laurence Sasso Jr., who responded with Greenville’s rescue truck. He recalled how the heavy vehicle became stuck in wet mud up to its chassis, and when the truck’s portable generators were put into service to power floodlights and exhaust fans, the truck became electrified! One fireman who touched the truck while standing on the wet ground became frozen in place unable to let go, and Sasso was forced to give him a hard shove to save him from possible electrocution! Thankfully that fireman didn’t suffer any serious harm, but fellow Greenville firefighter, 26 year-old Robert Broady, required hospital treatment for smoke inhalation. The bodies of Donald Arndt, and Vincent Mulvey weren’t recovered until after the fire was out. Arndt was found in the main storage room of the building, but there was a delay in his identification because he had forgotten his wallet at home that morning. Mulvey was found in a separate room still pinned beneath staging. Reverend Joseph P. Hynes of St. Phillip’s Church in Greenville administered last rites to both men. As to the living, besides Aldrich and Broady, nine others received injuries serious enough to require medical attention. An investigation into the cause of the disaster was conducted by state troopers assigned to the State Fire Marshall’s Office, along with investigators from the Rhode Island Department of Labor. Unfortunately copies of their reports were unobtainable for this article, but it was speculated at the time that the blast was caused by the ignition of flammable glue vapors produced by sprayers used to apply glue to the walls before attaching insulation. Despite the devastating tragedy, structural damage to the building was minimal. Construction was scheduled to be completed by January of 1963, but delays set the opening back until the following summer. When the facility opened, it became one of the first non-government underground computer centers in the United States. The building is still in operation today, storing and protecting important records as it was designed to do, however it is no longer owned or occupied by Industrial National Bank.